I am a 62 year old lady, and I have had cats my entire life, and after having several domestic short hair “regular” cats, I adopted my first Siamese back in the 1970’s . I have had nothing but Siamese ever since. They are filled with charm, affection, and I find it absolutely delightful to look into their mesmerizing blue eyes. All cats have grace, charm, and give us unconditional love, but there is definitely something special about the Siamese and oriental breeds. They have great longevity and life spans for the most part, and they are very tuned in and loyal to their people, much more like a dog, than many other types of cats. Most of my Siamese cats have lived well into their teens, and I lost my dear blue point, Marlin, just this last December at the age of 19. I still have two Siamese, however one is 13 years old, and my other little girl is only 3, so I decided that she needed a younger brother to play with. I was so happy to find that the cattery where I had adopted my last beautiful sweet girl, Lexie, had a little blue point boy who I was able to adopt. His name is Max, and not only have he and Lexie become very close, but they are also both great friends with my two Yorkshire terriers. These kittens had never even seen a dog before, but yet they took only a couple of days to adapt and play and love the dogs, as well as the other cats. I have found that when you find a great cat from a reputable cattery, such as the Clowntown Cattery in Phoenix, AZ, it only makes sense to adopt from the same place when you want a new pet. I have had the wonderful experience of getting to know Howard, the owner of Clowntown Cattery, through the adoption of my last two Siamese. He is a really great person who loves and respects his cats, whether they are for show or for pets. He has some of the most beautiful lines of Oriental cats I have ever seen, and the temperaments of the two I have adopted couldn’t be better. These cats are sweet, gentle, smart, energetic, love other animals and people, and I could not ask for better cats. They are healthy with clear sparkling blue eyes, and Howard is a very responsible owner who makes sure that the cats have all of their vaccinations before allowing them to be adopted. If you are looking for a quality Siamese or Oriental cat, I highly recommend Clowntown Cattery. You may look it up online and check out some of the beautiful champions Howard has, and if you are lucky as I was, you will end up with years and years of joy and love with these beautiful cats. If you would like to ask me any questions about the Clowntown cats I have adopted, you may get my e-mail address from Howard and I will be happy to tell you more. After much searching, we obtained a Siamese kitten (Szarina) born in 1999 from Howard. She has always been a joy to us. She believes she is in charge of my husband and is very expressive when he does not do what she believes he should be doing. Although Floyd was always okay with cats previously, he is absolutely crazy in love with Szarina. She has been extremely healthy. Prior to our purchase of Szarina, we had two back to back very sad and expensive Siamese kittens which lived only a short time. If Szarina had not been healthy, I would never had purchased another Siamese. We contacted Howard in late November, 2011 to inquire about the possibilities of purchasing another kitten from him. It was a delightful surprise when he informed us that two litters had just been born. He had only 3 remaining. Immediately I purchased a female seal point. On April 15, we went to the airport and picked up the most beautiful kitten I have ever seen. Samelia is very healthy, loving, talkative, and quite the comedian. She trained herself to retrieve all things within her reach and bring them to me. It took her awhile, but I did learn where to throw them for her to retrieve over and over again. I have been purchasing Siamese kittens for over 50 years. I have never purchased a second kitten from any other breeder. I can say unequivocally that Howard's kittens are healthy. They are also Siamese to the core – beautiful blue eyes, playful and loving. Howard, thank you for not taking the easy and less expensive way when you have your queens bred. If you would like more information concerning the two Siamese kittens we purchased from Howard, please feel free to call me at 916-868-0950. We were very fortunate to have found our beautiful Shaded Silver American Shorthair kitties through Howard Webster’s Clowntown website in 1998. At that time, Howard had a one-year old Mother Cat who had just had five (5) babies. We were lucky enough to get one of her baby boy kittens who we named Jackson. He was able to travel at 4 months old if he came with his Mother. Of course, we were very happy to get both mother and son. When they arrived, you would have thought we were expecting a baby! I threw out all old kitty bowls and boxes and went to the best store in Houston to purchase all new items in anticipation of their arrival. Of course, Howard had already sent us a list the foods they were eating so we had that on hand as well. The baby boy, Jackson, was still nursing which was so sweet to witness first hand. I could write a book about how much pleasure these kitties have given us. They are/were so loving and sweet. When they first arrived, Mama Cat was kind of stand-offish but came around to be a very loving and affection kitty. Jackson was always affectionate as he was still a baby and too young to know any better! Jackson was born in February, 1998 so he is now 19+ years old and still doing very well. Sadly, we lost Mama Cat last September at the age of 19-1/2 yrs. This was very traumatic and sad for all of us including poor Jackson who had never been without his Mama. It took him several months to get used to being an “only child” but now relishes that role. Did I mention Mama was the alpha cat so she made sure he knew who was in charge! Now Jackson gets whatever he wants whenever he wants it and is spoiled rotten. 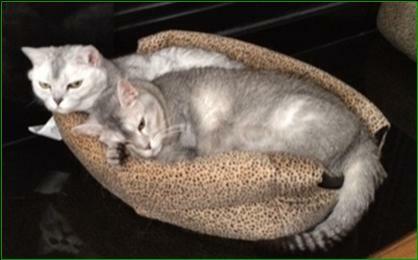 Maggie and her husband just purchased two more Shaded Silver kittens that will be ready this summer! If you would like to add your testimonial for this page please Just send me your letter and I’ll add it to the group .